Discussion in 'The War In The Air' started by CL1, Sep 15, 2013. RAF Fighter Command is claiming victory over the Luftwaffe after a day of heavy bombing raids ended in big losses for the enemy. According to the RAF, 176 enemy aircraft were destroyed by fighter planes. At least another nine aircraft were hit by anti-aircraft guns. British casualties were much lighter - only 25 aircraft lost with 13 pilots killed or missing. The Air Ministry says the German losses are the highest since 18 August, five days after the Battle of Britain began in earnest. Today there were two major attacks on London during daylight and a number of smaller raids on the south coast in the Portland and Southampton areas. The first big attack came in the morning at 1100 hours. A wave of about 100 German aircraft was spotted heading over the Kent coast towards London followed by a second wave of about 150 planes. Spitfire and Hurricane squadrons were sent to meet them and many German planes are reported to have turned away without dropping any bombs. However, Buckingham Palace was hit during this initial raid. Two heavy bombs fell, one on the Palace buildings and one on the lawns. Neither exploded but one caused damage to the Queen's private apartments. The King and Queen were not in residence and there was only a skeleton staff who were sheltering in the basement. It is the third time this week the palace has been targeted. At about 1400 hours another wave of about 150 German planes crossed the coast near Dover - again followed by a second wave of 100 aircraft. They appeared to be heading for targets in south London and railways in London and Kent. Fighter patrols were again ready to meet the enemy and only 70 or so enemy planes reached central London where there were a series of dogfights. The attacks continued with smaller raids on Portland and Southampton. 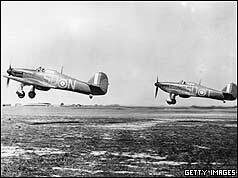 Again the enemy aircraft were successfully driven off by the British fighters. As darkness fell, the raids continued on London inflicting major damage on targets in the south of the city. Railway bridges were hit between Victoria and Clapham Junction, the railway has also been hit at East Croydon, gas and water mains have been disrupted and St Thomas's, Guys and Lambeth hospitals were all hit although there were no casualties. Two days later it became clear Hitler had indefinitely postponed Operation Sealion - his plan to invade Britain. British intelligence decoded a message from the German General staff to the officer responsible for loading the transport aircraft earmarked for the invasion ordered him to cease the operation. Without this equipment there could be no invasion. Air raids continued over London and the south east of England into October and the German bombers inflicted considerable damage and casualties. But they were also losing planes faster than they could repair or replace them and switched to night-time raids. As summer gave way to autumn and worsening weather conditions, the Germans realised the RAF could not be beaten in 1940 and as Germany was preparing to attack Russia, Operation Sealion was cancelled. The actual number of planes lost is far lower than the RAF and Luftwaffe claimed at the time. In fact only 60 German aircraft were shot down on 15 September. In total the RAF claimed to have shot down 2,698 German planes. The actual figure was more like 1,294. The RAF lost 788 planes - far fewer than the 3,058 the Luftwaffe claimed. Roy Martin, Roxy and nicks like this. He was no Galahad, no knight sans peur et sans reproche. Sans peur? Fear was the second enemy to beat. Not as he is portrayed, but as the man he was. Roy Martin, Roxy and CL1 like this. PS it is 28 year today that I took the oath of allegiance. Gage, Roxy and CL1 like this. Battle of Britain day, 15 September. A day worthy of remembrance. "If 15th August showed the German High Command that air supremacy was not to be won within a brief space, 15th September went far to convince them that it would not be won at all." For this day only, to indicate the severity of the days combat actions the full casualty list is displayed.